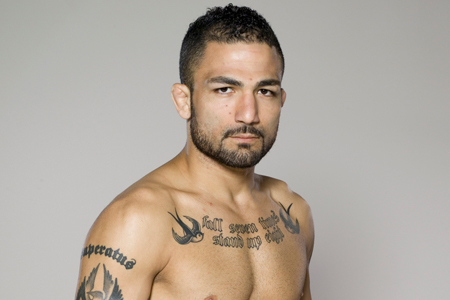 Following a controversial stint as a contestant on “The Ultimate Fighter 14,” Akira Corassani (Pictured) will make his UFC debut against Jason Young on April 14th in Sweden. Swedish website MMAnytt.se first reported the featherweight affair. The UFC confirmed the announcement by re-tweeting their post on Twitter. An injury prevented Corassani from participating in the ‘TUF 14 Finale’ this past December. The 145-pounder created quite the ruckus during his time on the reality series, but looks to start anew in his big league premiere. Young, on the other hand, is likely fighting for his UFC life having lost his first two scraps inside the Octagon. “Shotgun” had won four of his last five contests prior to joining the world’s biggest MMA organization. A light heavyweight shootout between Sweden’s own Alexander Gustafsson and Antonio Rogerio Nogueira headlines the festivities. Ericsson Globe Arena in Stockholm, Sweden hosts the shindig. FUEL TV will air the main card live in North America at 3PM ET/12PM PT.